Yep. There are mirrorless cameras in all those sensor sizes. At Small Medium Format both Fujifilm and Hasselblad have current cameras. At FX (old 35mm film size) we've got several Canon, Leica, Nikon, Panasonic, and Sony. At APS-C we've got the Canon, Fujifilm, and Sony models. At m4/3 both Olympus and Panasonic make a wide variety of models. The Nikon 1 (what they call CX) checked in at the next lower size. And at the bottom, we've got cameras like the Pentax Q and some of the older Ricoh GXR modules. That image I show is in scale, so the light collection area does vary considerably, doesn't it? So what size should you get? All else equal, there are advantages of a larger sensor over a smaller one. Unfortunately, all else is rarely equal. Different sensor technologies have different fill factors, different efficiencies, and you may find they have different megapixel counts. So there is no simple answer, but some general ones to pay attention to. Both Fujifilm (GFX) and Hasselblad (X1D) make mirrorless camera models with the Sony 50mp "medium format" sensor (44 x 33mm). Medium format is in quotes in the previous sentence because most of us that remember medium format from the film era remember a larger capture size (56 x 44mm). I refer to the Sony 50mp sensor as "small medium format," therefore. This format is larger than the old 35mm film frame (36 x 24). That means to get to equivalent lens values you need to multiply by 0.79x. A "normal" lens for small medium format is in the low 63-64mm range: Fujifilm has picked 63mm. Both the Fujifilm and Hasselblad—as well as a few other cameras, such as the Pentax 645Z—use the same Sony sensor, though Fujifilm claims that they've changed the layers just above the photocells (e.g. microlenses). This is a state-of-the-art Exmor-type sensor and produces excellent data. Full frame (FX in Nikon nomenclature) sensors are the same size as 35mm film was, give or take an eensy bit. If you're coming from a film camera or FX DSLR full frame lenses all work as you'd expect them to. A 50mm lens is "normal." A 24mm lens gives you a 74 degree horizontal angle of view, just as it does on your older cameras. While you'd think that the full frame M9 sensor would be efficient, unfortunately it's a CCD from an older generation of sensor designs. While it's not a bad sensor, it doesn't match what state-of-the-art full frame sensors can do (e.g. D5, D810, 1DxII, 5DIV). The sensor in the later M (Type 240) is better, and the Leica M10 sensor better still. Today we have Canon (RF), Leica (L), Nikon (Z), Panasonic (L), and Sony (FE) all competing with state of the art full frame sensors. You have more choice at this sensor size than any other. And yes, there is variation in performance: in low light (e.g. the Sony A7Sm2), in burst speeds (e.g. the Sony A9), and in megapixels (e.g. 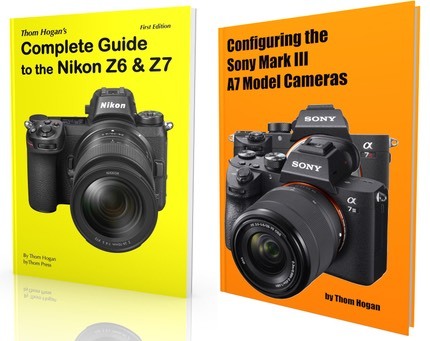 the Nikon Z7 and Panasonic S1R). Thus, you have to understand what you're trying to optimize for when picking a full frame mirrorless camera. Pretty much all of the APS-C sensor mirrorless cameras equal the image quality of the APS-C sensor DSLRs. Canon uses the same exact Canon-produced sensors in their mirrorless and DSLR models; Sony did the same thing with their models, using Sony sensors. Fujifilm uses a custom filtration system over a standard Sony APS-C sensor. Most APS-C sensors are 24mp, though we're now seeing some 26mp ones. You can see just how hard it is to make apples match up with apples when trying to compare sensors. I'm only three sensor sizes in and we've got three different levels of performance to consider. Not hugely dramatic differences, but enough to make you wonder if buying into one size or another is the right choice. I'll save you some grief: unless you have a specific need don't get too worried about whether a sensor line exceeds or lags expectations. Those expectations are that APS-C is one stop behind full frame, m4/3 is less than a stop behind APS, and 1” is a stop behind m4/3. Going the other way, small medium format is perhaps a stop better than full frame. Over time, things all equal out. Put another way: if you buy something that's slightly behind where it should be today, within a couple of years you'll have body upgrades available that will put you back to expected performance or even ahead. Likewise, if you buy something that's slightly ahead of the curve, the next bump might not be quite so interesting. These are system cameras, and it's all the components of the system together that are important. You're not buying a sensor, you're buying a camera body, a sensor, lenses, flash, remotes, and maybe even more accessories, and you're buying them over time. The first mirrorless cameras came from the transition from 4/3 (a DSLR-type design) to m4/3 (mirrorless) by Olympus and Panasonic. The Olympus Pen E-P1 and Panasonic GF-1 and GH-1 were the first widely available and fully fleshed out mirrorless cameras. Both companies have been rapidly iterating ever since (well over 40 different cameras now!). The 2x crop of the m4/3 sensor is slightly less than the same level of drop down from APS-C in size that APS-C is to full frame, though it comes with an aspect ratio change, which if you crop to the same aspect ratio, really puts m4/3 at a stop below APS-C. m4/3 is still considered a large sensor compared to what's likely in your compact camera or cell phone. The thing that makes the m4/3 size so interesting is that it's small enough so that the smaller imaging circle required of lenses makes for...you guessed it...smaller lenses. The drop in size of lenses from full frame (FX) to APS-C (DX) isn't terribly dramatic, nor is the drop from an APS-C (DX) lens to m4/3 lens. But the difference between my Nikon full frame kit with a full range of lenses that cover 14mm to 400mm to my m4/3 kit with lenses covering the same angle of view is much more dramatic. My biggest complaint about m4/3 used to be that Olympus was still using sensors that weren't really state of the art when it was launched. That changed with the E-PM2, E-PL5, and OM-D E-M5 introductions, which had very state of the art sensors. The current lineup uses new Sony-derived sensors. Panasonic also moved on to newer sensors that moved the image quality bar forward, as well. Recently, both Olympus and Panasonic have gone from 16mp to 20mp in most of their models, and are using basically the same technologies as in the APS-C sensors. There's less than a stop difference between APS-C/DX cameras and m4/3 cameras, all else equal, but you'll be giving up a few pixels (20mp versus 24/26mp). One more step down in size—again about the same near one stop step as between each of the other adjacent sensor sizes—comes the Nikon 1. While the smaller sensor size could have produced an even smaller body and lenses, in practice, many of the Nikon products in this format have been near the smallest m4/3 camera size overall. The good news is that the Nikon 1 sensors have been state-of-the-art in efficiency, so they tended to play above their league. Nikon has once again shown that they know how to make very efficient sensors. One thing to consider, though: the 1” sensor in the Nikon 1 models is now the same as the 1” sensor in many Canon, Panasonic, and Sony compact cameras. Moreover, many of those fixed-lens models have better lenses than you get with the Nikon 1 kits. Personally, I wouldn't invest in Nikon 1 (CX) at this time because of that. If we step down yet again—slightly more than the steps we took in the other sensors we looked at, above—we get to sensors that are the size used in many compact cameras, especially older ones. Right now, the Pentax Q and some of the no-longer made Ricoh GXR modules use sensors in these very small sizes. The problem with small sensor size is that you're fighting a floor: there's a randomness to photons in the world. As you collect fewer and fewer of them, their randomness shows up as shot noise. It doesn't matter how good the electronics are, noise is generated simply from the randomness of light. These small sensors tend to be near enough that floor that shot noise is indeed a factor that needs to be always considered, even in brighter light. When you buy a mirrorless camera with a sensor this small, you're essentially saying that you want a compact camera, but one that you can change the lens on. That's a perfectly valid point of view. Just make sure that it reflects your desires and needs. One thing we talk about in photographic circles is "equivalency." What we usually mean by this is "what equipment and settings do we need to make the same exact shot with different format cameras?" You'll also hear people talking about photons in equivalence. Smaller sensors need faster lenses to capture the same number of photons and have the same signal-to-noise ratio as larger sensors. But I'm going to skip past this notion for this discussion and just assume that we're shooting in good light at base ISO with very good sensors for their size (i.e. noise and dynamic range aren't going to really impact our image). Of course, we already have our first casualty: the Coolpix shooter doesn't have 64mm or f/1.8, their fixed lens only goes to 42mm and f/5.6. More over, I've left off small medium format as there really aren't lenses that would be equivalent for it, too. We've now completely lost the Nikon 1 shooter and we're starting to lose the m4/3 and APS-C shooters, as any reasonable lens choice is starting to disappear (e.g. the Olympus shooter has a 12mm f/2, but not an f/1.4). So, if our goal is to take pictures "that look just like we took them with 35mm film," then the equivalence notion starts putting restrictions on us, especially as we go to the extremes, like wider and faster. We just can't get to equivalent (and again, I'm not trying to bring photons and dynamic range into this discussion). Hmm, the Nikkor 50mm lens only goes to f/16, so we're starting to lose the FX shooter. Moreover, diffraction comes into play with some of these options, as well. The simple fact is that there are looks you can't get with small formats that you can with large formats, and vice versa. The trick is to pick the right tool for the right job, and therefore to understand the underlying differences of your tools. I don't use m4/3 to replace my FX equipment; I use m4/3 to supplement my FX equipment. Yes, these at times overlap, in which case I can pick small/light or phenomenal dynamic range/noise properties (but not both ;~). Everything in photography is about balancing decisions. Everything. You may make hundreds of decisions to get a single good photograph, and one of them is to choose the right tool for the job. I see the mirrorless cameras as just another tool. I wish the tool were better targeted towards me (more direct control, for example), but they do potentially offer me some options I didn't have before, so it's welcome. I think a lot of the heat in the discussions about mirrorless cameras is the "I want something that can do everything" notion. People want small, light, inexpensive, high image quality, flexible, robust, and a few other things all in one package. But there's a simple fact of life: the more things you require from a tool, the more compromised and/or expensive it is. Moreover, some combinations are impossible (or at least improbable): small, inexpensive, and high quality, for example.